Most business owners are not writers, yet a website needs content. How do you get around this dilemma? Think **around** the brick wall. Content writing is so much more than writing blog posts. Neil Patel gives an excellent definition of content marketing – it’s all about telling stories. And you can tell stories in 1,007 different ways. Jackie Pearce talks about using stories in your marketing on GrowMap.com here. Before you start adding any new content, you need to check what you have already. Outdated articles will increase your bounce rate and negatively affect visitors’ value judgments. Ryan Stewart has a free content audit template that will help you decide what to keep on your website. If a page gets traffic from Google, you need to keep that page. But if it has a high bounce rate, you will need to improve the page’s quality. Words only work for some people. Most people (65%) remember facts better if you include a relevant image. Videos, infographics, photos, memes, and slide shows are all easier to view on mobile devices than pages of text are. Video content works, whether you embed it on your site or use YouTube. Live video on Facebook will appeal to many customers. Use video to tell your story. Put a brief video on your About page, so people see and hear you rather than just seeing your photo. Never set your videos to play automatically. If people are viewing your site from a work environment, the last thing they need is your auto-play video booming your voice all over the office without any warning. Always use a transcription service, so your site visitors have the option of reading what was said rather than watching the video. Podcasts are another non-writing medium to consider. A regular audio podcast is especially useful for building a loyal following when your marketing message is not a visual one. You could then use each podcast episode (complete with transcription) as a blog post. Audio podcasting has a low start-up cost because all you need is a $50 microphone. Both video and audio add another element of trust for customers. They see or hear you and can use visual and audio cues to form a better judgment of you and your business. Infographics take a lot of energy to create, but are worthwhile because of the increase in user interaction they give you. Be careful to make your infographic simple to understand. Avoid large blocks of text, and use color combinations that are easy on the eye. It is better to outsource your infographic production because DIY graphics are often terrible. Photos attract visitors’ eyes if they are of real people. Stock images and manipulated photos are widely ignored. Having images just to break up your text is an inefficient use of your web page, so replace those images with your own photos. But you need lots of images, and they all need to be relevant. Use graphics such as bar charts to illustrate points. Use relevant quotations, especially humorous ones, where you can. You still need words on your page. Some visitors do prefer written content because they can skim it faster than they can watch a video. If you can’t write your own content, then you will need to farm it out to freelancers. Even paying an employee to spend four hours a week writing blog posts is very expensive compared to typical freelancing rates for high-quality writing. Pay a fair price for the work and build a relationship with one or two writers. Then they can come to understand your business and turn in better articles over time. Every piece of content must have a purpose, solve a customer problem, grow your reputation, or provide a resource to which others will link. Content for its own sake is just more internet clutter that people will never see. You must tell your writer what you want her to write. Tell her your purpose behind each article. Doing so will force you to think about and justify each piece of content. Provide a provisional title, subject, and an angle that relates to your customers’ needs. Video, other visual content, and podcasts have already left written content in the dust. Everyone needs more visual marketing and fewer written words. This is really informative for me.As I was in a big dilemma that how can I write Content for my website. Your post has given me a hope to do so. I agree with you on the infographics. They are hard to make but once you make sure that your infographics is well designed and informed. More people will be keened on reading that rather than the texts that you put on either your site or blog. Thanks for sharing this! Visual Content Marketing is extremely essential to bring out with flying colors. This post is very informative concept, now I got the idea that how to play with content. e estou no brasil, mais vejo que aprender com voces e muito melhor do que alguns experts aqui do brasil, parabens mesmo. Translation: Congratulations to your blog, I always looked for relevant content like yours. I’m learning digital marketing. And I’m in Brazil, but I see that learning from you is so much better than some experts here in Brazil. Congratulations. These are some excellent strategies Dana! us making use of it, they’ll quickly seek our nearest competitors, who do! Thanks for sharing another awesome, and extremely helpful blog post! Mark would love you to read ..Why Your Best Lead Magnets Don’t Have To Be Expensive To Be Really Effective! Thanks for taking the time to read and comment. 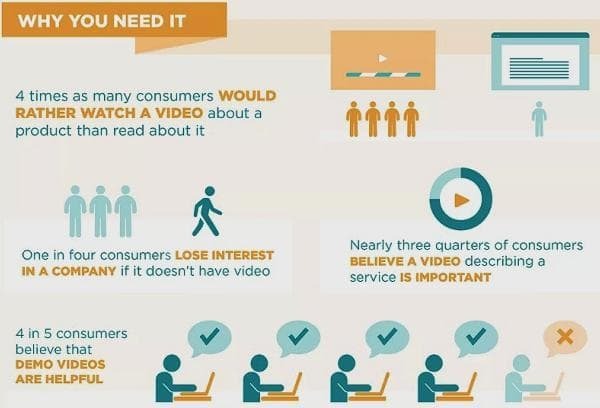 Video is a strategy that we all need to implement more consistently. I’ve noticed that you regularly include a video in your content. That is a very good idea with so many people using mobile devices now even when viewing long form content. That was a great collection of visual content marketing. Thanks for your post. And i like your post. Really awesome and very informative post about content marketing. I was looking fof this kind of information. Great post. I’ve been noticing the trend towards video other non-written content for a while now with the rise of podcasting and Youtube basically becoming the new television for the younger generation. Do you have any suggestions on where to outsource infographics? I’d love to be able to do them myself but my Photoshop skills are less than stellar. Thanks! Loved your post, was struggling for the marketing ideas and was searching what new I can do on my blogs and your post helped me like a helping hand. Thanks for a great share. Do check my recent blog and share your views.